PROJECT SUMMARY: This secluded piece of property sits on several acres in Summerfield, NC withdrawn from the street and busyness of city life. Southern Lights spent some time with this couple and quickly realized that our ideas about the project aligned and that we were a great match to design their outdoor lighting system. The goal was to keep this rustic piece of property rustic. Light, but not over light. Southern Lights chose not to highlight everything, but bring more attention to certain features on this beautiful natural stone home in Summerfield to create more drama. Voids of light can add to the creative design if done properly. During the design phase, Southern Lights provided the road map and detailed lighting designs for this client capturing this beautiful setting at night, creating the most ideal landscape lighting scenes. 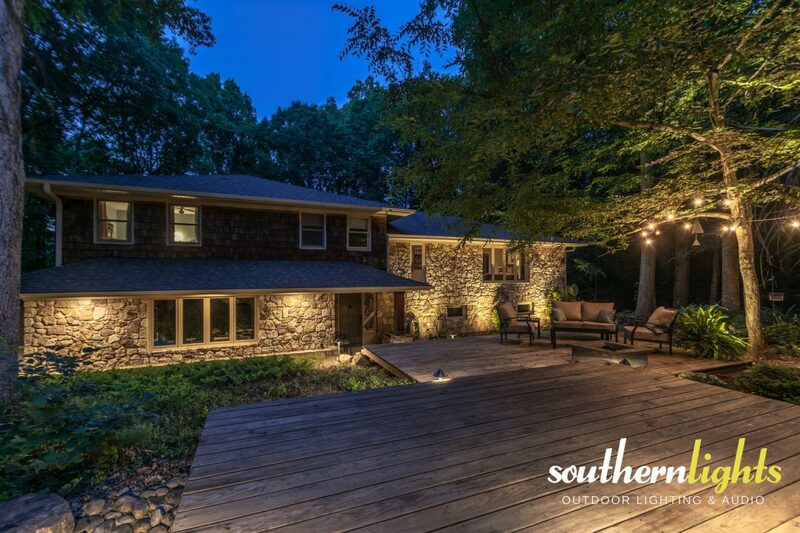 LANDSCAPE LIGHTING FOCUS: The backdrop of our lighting design was this beautiful natural stone home. We knew that needed to be the main focus with different lighting design and effects surrounding it. Security lighting was needed to help illuminate a very dark space and keep intruders out. LOCATION: The lighting designs and installation for this project can be found deep in the woods of Summerfield, NC 27358. LANDSCAPE LIGHTING DESIGN: Ideal landscape lighting should evoke Safety. Security. SERENITY and should always start with a design. The front walkway again was a main focus for these clients. Wanting to use fewer fixtures and keep cost down, Southern Lights decided to use Soffit lights under the eaves of the front of this stone home rather than a sea of path lights. We were able to achieve a great look on the natural stone, while also providing an ample amount of light onto front walkway. Southern Lights has the opportunity to work with a lot of amazing clients and this couple was no different. Their love for their home shined through in their appreciation for the beautifully illuminated landscape lighting on this property. Elevation changes around the front entrance posed some challenges relating to safety, so a proper fixture was needed to provide enough light in the area without blinding guests or flooding the area with light, killing the overall lighting design and effect. Southern Lights was able to locate and install the perfect solution and fixture for the area (Soffit Lights). Many homeowners may already have soffit lights with some of the new home construction trends, but the problem lies many times with the harshness of light and the difference in color temperature and beam angles. These two elements will completely destroy a lighting design. Tying our low-voltage lighting soffit lights into the rest of the system, ensures we get a consistent effect and can make sure the control systems are linked so that these lights will come on with the rest of the system.